The Gog Blog by Rory Spears, Editor and Director of Content. Follow Rory on Facebook, Linkedin and Twitter @GogBlogGuy. At the Mt. 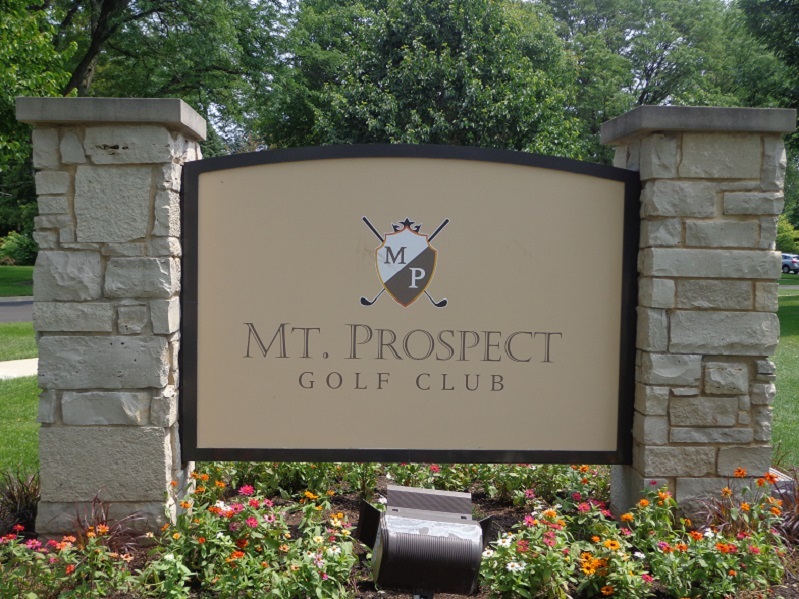 Prospect Golf Club. The Mt. 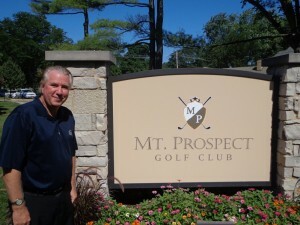 Prospect golf club where, “What’s Old is New” is where the game takes me today. It’s a belated birthday round. Do you play on your birthday, i try to all the time, it’s a great way to spend part of your day, on your day. I haven’t played the club since it opened to the media on July 30th, since then I have heard some great things about the Dave Esler renovation, that took the club back to it’s roots of 1926 when it was originally built. Esler gave the club some real old-time features, like squared off tee boxes, punch-bowl greens, a biarritz green and more. Architects like Seth Raynor and Charles Blair Macdonald would be proud and the course has a feel like these great architect’s of that time and day, might have created something just like it, if they were with us today. Call (847)-259-4200 and make your tee time today and go play the course before winter hits, you will be glad you did. I enjoyed catching up with Esler at the Illinois Golf Hall of Fame dinner last Friday, who says the feedback he has received on Mt. Prospect has been incredible. Esler is now working on a project in Oregon not far from Bandon Dunes. I’ll keep you informed of it’s progress in the weeks ahead. 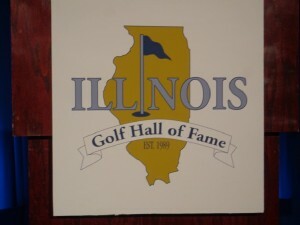 THE ILLINOIS GOLF HALL OF FAME induction dinner was Friday night at the Glen Club, scroll down and see our story from the weekend if you haven’t already. A congratulations to the class of 2015, that included H. Chandler Egan, Leon McNair and Jim Sobb. All three men very deserving. The dinner was MC’d Tim Cronin who did a great job. 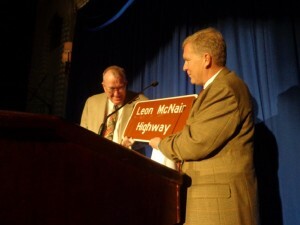 The State of Illinois did something right, they approved Leon McNair Highway to become part of Rt.34 in front of and around the Fox Bend Golf Club in Oswego where McNair worked for so many years. I enjoyed the Global Golf Post issue last week. 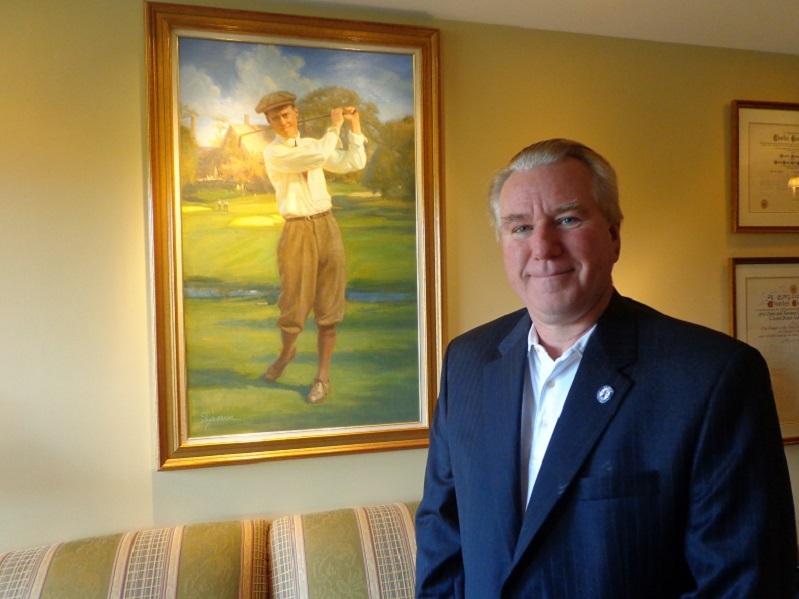 Great story on Herb Kohler of Kohler Company and his influence on the community of St. Andrews in Scotland. Do check it out. 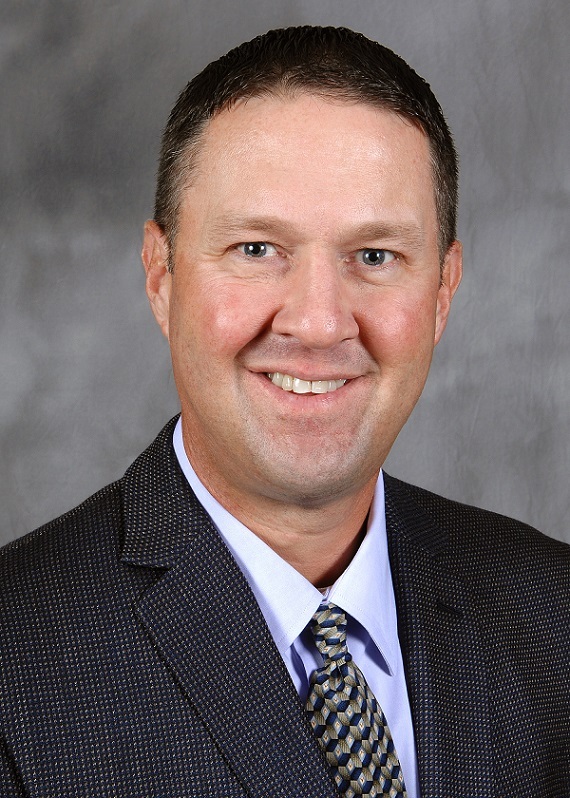 A tip of the cap or golf visor goes out to the Illinois Golf program and Coach Mike Small, who won the Tavistock tournament last week, which made Illinois #1 inn the country again, along with Auburn. Illinois heads to East Lake next week for the final tournament of their fall season, it will be shown on the The Golf Channel. 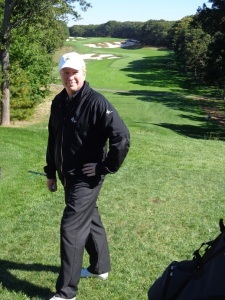 BIG 3 partner Len Ziehm has been posting updates from his west coast trip, all sorts of travel ideas from Ziehm at Lenziehmongolf.com. The Gog Blog by Rory Spears, Editor and Director of Content. Follow Rory on Facebook, Linkedin and Twitter @GogBlogGuy. With the Chick Evans portrait at the Glenview Club (L), at the Illinois Golf Hall of Fame 2015 dinner at the Glen Club. They are in, the 2015 Class of the Illinois Golf Hall of Fame was inducted into the hall at the awards dinner held at the Glen Club in Glenview. This years class was made up of three members, H. Chandler Egan, who grew up in Highland Park. 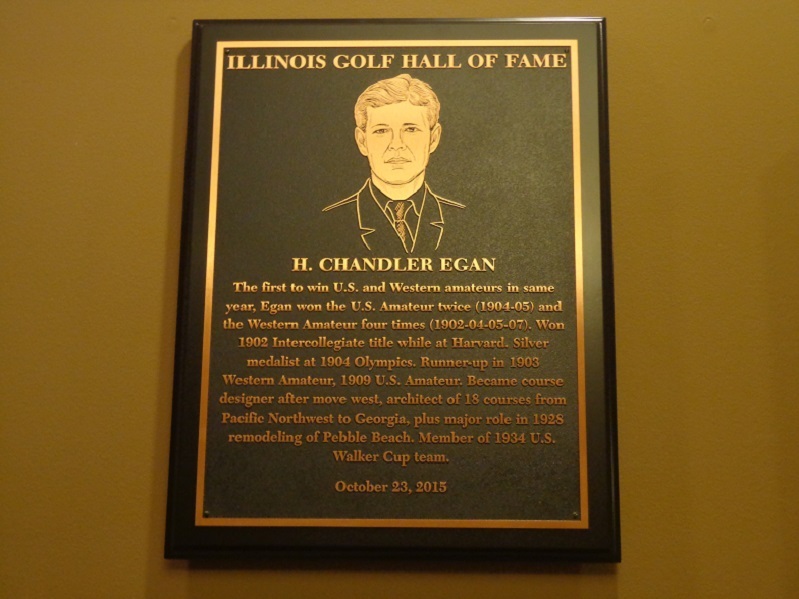 Egan won the Western Amateur 4 times, and the U.S. Amateur twice. Egan was champion of the Intercollegiate in 1902, and the 1904 Olympic games held at Glen Echo, and the 1909 U.S. Amateur. Egan then went into course design out west, where he designed 18 courses. His work includes the famed Eugene Country Club and helping with the remodeling of Pebble Beach in 1928. He was a Five-time winner of the Pacific Amateur and a long time member of the Exmoor Country Club. 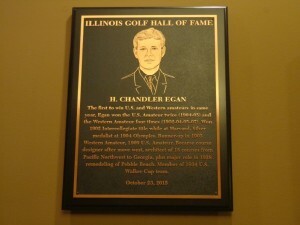 H. Chandler Egan Hall of Fame Plaque. Leon McNair the long time IPGA professional at the Fox Bend Golf Club in Oswego, who also spent years working with golf course builder Brent Wadsworth. McNair is a board member of the First Tee of Aurora and the Fox Valley. McNair has been involved in charity and finding ways to give back to the community just as much, as he has done on or around the golf course. With the help of the community where he served, and former state representative Tom Cross, part of Rt. 34 that runs past the Fox Bend golf club has been renamed Leon McNair highway. Ivanhoe Director of Golf Jim Sobb during his Hall of Fame acceptance speech. Jim Sobb the only head professional the Ivanhoe Club has ever had, was the final member to be selected. Sobb has been a leader and a champion on and off the golf course for years. It started at Palatine High School where he played golf and football, and then onto Western Illinois University to play on the golf team. After school ended he became a member of the Illinois PGA, working at a few area clubs before joining Thorngate Country Club. 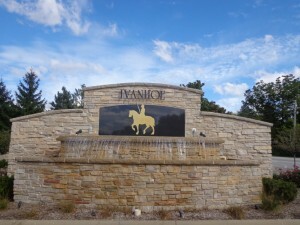 That club was sold and moved up to it’s current location in Ivanhoe. Sobb oversaw the transition and the move. On the course Sobb has won several IPGA majors including three IPGA Section Championships (1995-99-2000) and four Illinois PGA Match play titles (1990-93-95-2011). 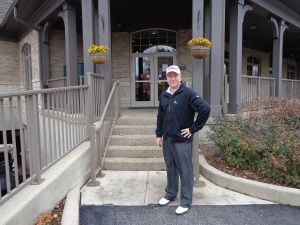 In 2011 Sobb became the only player to win the IPGA Match Play title and the IPGA Sr. Match Play title in the same year. He has played in 22 Radix Cups, the most of any professional. Sobb is two-time winner of the IPGA professional of the year award (1995-2000). He has played in the PGA Championship, the U.S. Sr. Open and the Sr. PGA. Sobb has organized the Ivanhoe Invitational, that brings many of the top high school golf programs to the club for a tournament every fall. 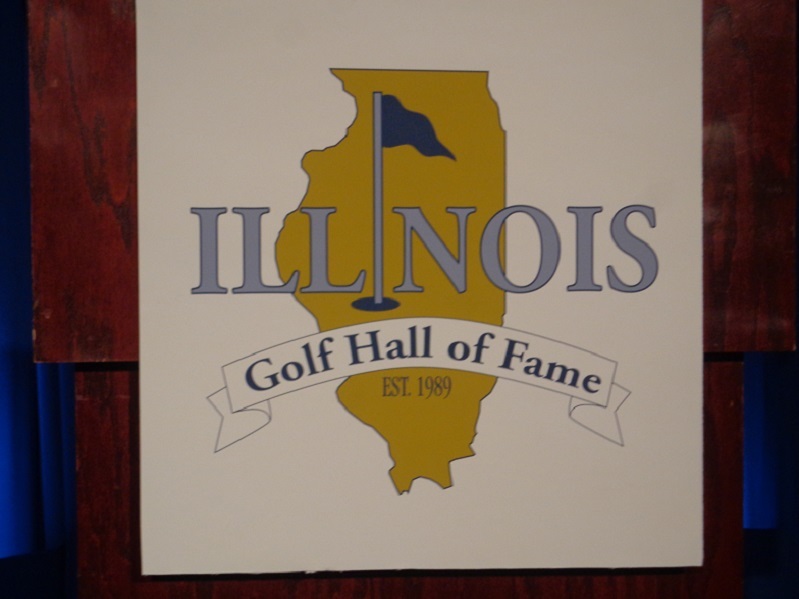 The next class to join the Illinois Golf Hall of Fame will be selected in the spring of 2017. 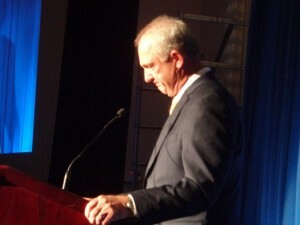 The selection committee chairman is Tim Cronin, who served as the MC at the induction dinner. 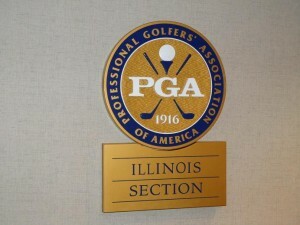 The Illinois Golf Hall of Fame, is located at the Glen Club in Glenview, it is open when the club is open, and there is no charge for admission. 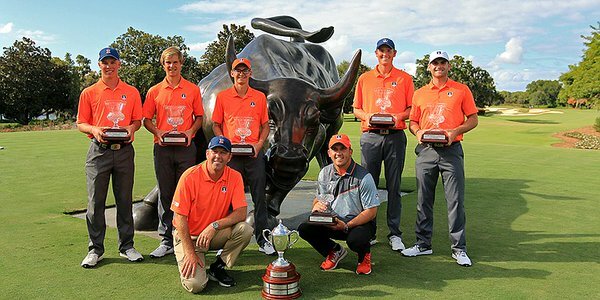 It’s one of the biggest fall tournaments of the college golf season, and the University of Illinois came out on top at the Tavistock College Invitational with a team score of 1-over par. Illinois shot 1 under par on the final day of the tournament to win by 4 shots. #1 Illinois had #10 Arizona State and #15 California right behind them for second and third place. The University of Illinois Men’s Golf Team at Isleworth Country Club. Photo courtesy of University of Illinois Athletics. “This one of the bigger, more prestigious college events in the country, played on a difficult and tricky golf course,” said head coach Mike Small. “The wind was really strong all three days and I thought our guys really persevered through that adversity. This tournament was a great test for us because it was a close one, we were a ways back to start out and Arizona State played close to the end. It’s great for our team to compete at a tournament like that and earn the win by pulling away. To come away with three top-10 individual finishes is also pretty big, our guys really persevered this week and I’m proud of that. Sophomore Nick Hardy carded a 3 under par 69 third round score to finish third in the tournament. Sophomore Dylan Meyer finished in sixth place. Senior Charlie Danielson came in tied for seventh place. Alex Burge and Thomas Detry both ended up in tie for 37th place. The tournament saw 5 other ranked teams compete in addition to the three ranked teams that finished 1-2-3. Illinois now prepares for the East Lake Cup on November 2-3, a match play event that will be shown live on The Golf Channel. Visit FIGHTINGILLINI.com for more details on the men’s golf team. For Illinois they won their second tournament in a row. Nick Hardy was named the B1G Ten player of the week, and Illinois moved back into the No.1 spot in the Golfweek Bushnell NCAA Golf College rankings, along with Auburn University, each school had 8 first place votes. 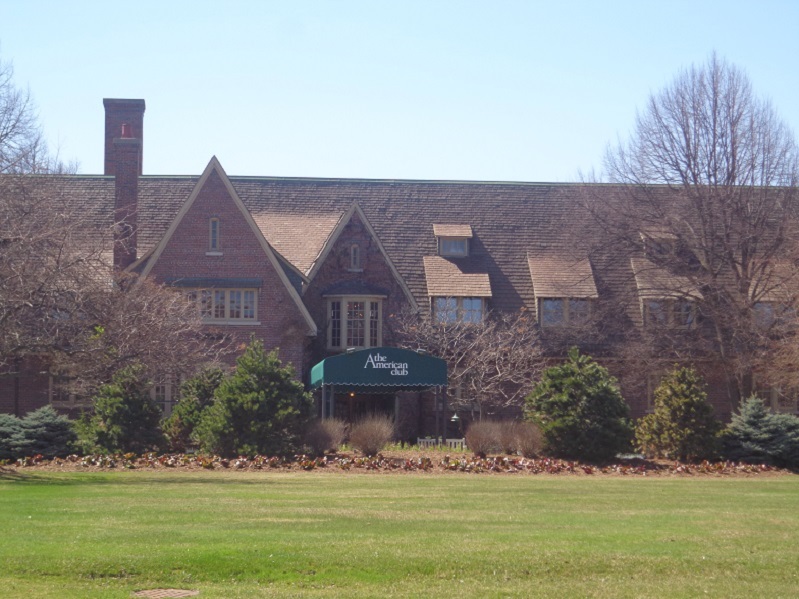 The city of Aurora Illinois, has announced that it’s Fox Valley Golf Club will be closing for the 2015 golf season on Sunday November 1st. The golf club will not be reopening in 2016 or beyond. 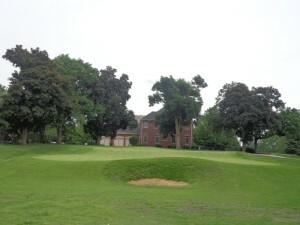 The club located on Rt.25 has been a home for golfers for over 4 decades. It was annexed to North Aurora over 20 years ago. In recent years the aging infrastructure of the property was requiring more than 1 million dollars to keep going, it would take even more money to keep the club operating. As a result, earlier in 2015 the city voted unanimously to sell the course to Odawa Development LLC, for 5 million dollars. 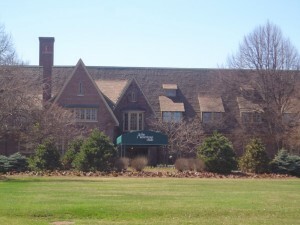 “The City of Aurora and the golf staff would like to thank the patrons who have continued to support the Fox Valley Golf Club over the past 40 years,” said Jeff Schmidt, Aurora PGA Operations Manager. For any golfers that would a final round or more in the final weeks of the club while in operation, there are special rates. WEEKDAY 18 holes and cart $33.00, 18 holes and cart for Seniors $28.00, twilight 18 holes and cart is $28.00, regular super twilight and cart (after 4 PM) $22.00, 9 holes with cart $22.00. WEEKEND RATES 18 holes with cart $37.00, Mid-Day with cart $35.00, Twilight after 2 pm with cart $29.00, twilight after 4 pm $22.00. Call the Fox Valley Golf Club at (630)-879-1030 to make your tee time. To continue to enjoy golf in Aurora, please enjoy the architect Greg Martin renovation of Phillips Park, located at 1001 Hill Avenue. For more details on Phillips Park please visit online phillipsparkaurora.com. The Gog Blog by Rory Spears, Editor and Director of Content. 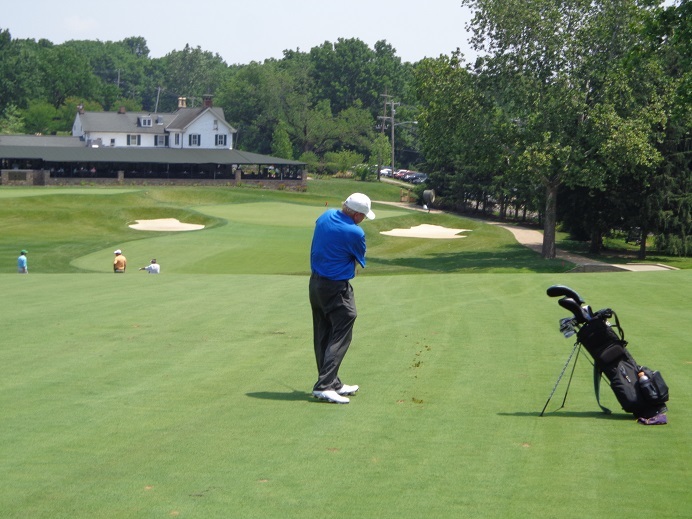 Follow Rory on Facebook, Linkedin and Twitter @GogBlogGuy, swinging the original Titleist AP1 Irons at the Philadelphia Cricket Club. Editors Note: This is the first in a series of stories about new golf products starting to come online for the holiday season and into 2016. Titleist Golf has released new irons, hybrids, and golf balls. Titleist custom putter designer Scotty Cameron has just announced some new versions of the Futura Putter. Coming this Friday October 23, in golf shops world wide will be the new Titleist 716 AP1 and AP2 irons. The upgraded irons are now engineered with a high density tungsten to deliver a combination of low center of gravity (CG) and a high moment of impact (MOI) for better distance, forgiveness, and shot-stopping control. The new Titleist AP1 and AP 2 irons. The two irons have been designed for two different styles of players. AP1 irons are for players that are looking for maximum distance and forgiveness. AP2 irons are for players that want distance but forgiveness in a tour proven iron. Titleist Golf says that the new 716 AP1 is the longest most forgiving Titleist iron ever. The AP1’s extreme 360 degree undercut cavity design with a large, thin, unsupported face delivers speed and launch for more distance, while the industry-leading use of high density tungsten weighting provides maximum forgiveness. Titleist Golf says the 716 AP2 is the most advanced players iron, made even better, it delivers tour-proven distance with forgiveness and solid forged feel. New AP2 irons use a extremely high density tungsten weighting to position the center of gravity low and perfectly aligned at impact for more speed. An innovative co-forged construction places the high density tungsten low and to the perimeter, increasing MOI for greater forgiveness and consistent distance. The new Titleist 716 AP2 Iron. When it came to the design on the 716 AP2 irons, Ines told her team to design the best club possible, put the tungsten where we want it, and don’t worry whether we can actually make it. Then the Titleist development team did figure out to design the club. As a result Stone says that,”there is not a better tour-player iron with better technology than the AP2. The 712 series that came out in 2011 has been a forgiveness leader by a wide margin for years, but Stone says the construction has improved two times since then. Some of the differences include on the AP1, a new pre-worn leading edge and cambered sole that reduces digging and allows a smoother entry and release from the turf, essential for agame improvement head size. AP2 has a fractionally wider sole (as compared to the 714 AP2) with trailing edge relief that helps the club get through the turf fast with less dig. The irons hit the PGA Tour in late July at the Quicken Loans National, Bill Haas put them in play that week and was T-4 and since then 30 tour players have made the switch. PRICES: 716 AP1 Steel MAP $112.50 per club ($899/set of 8) MSRP $125 per club. Graphite MAP $137.50 per club ($1,099/set of 8) MSRP $150 per club. 716 AP2 Steel: MAP $150 per club ($1,199/set of 8). MSRP $168 per club. Graphite: MAP $175 per club, ($1,399/set of 8) MSRP $193 per club. The Gog Blog by Rory Spears, Editor and Director of Content. Follow Rory on Facebook, Linkedin and Twitter @GogBlogGuy, with Gary Player at the WGA Green Coat Gala. The Western Golf Association hosted it’s annual Green Coat Gala last Friday night downtown in the city. The guest speaker was was Gary Player the”Black Knight” winner of nine majors. Kudo’s to the WGA for landing Tom Watson, Jack Nicklaus and Gary Player in the last three years to help raise funds for the Evans Scholars Foundation. The dinner in 2014 raised over $800,000 dollars, I hope that 2015 was just as successful. There are now more than 10,000 alumni of the ESF program. If you didn’t see my story from over the weekend, please scroll down and check it out, Player as always was candid with his opinions from our interview. I was joined by an Evans Scholar in asking Player questions. Titleist Golf has rolled out several new products, and some upgrades to their current line. I will have some previews coming up during the week ahead. Their new driver the 915 is receiving rave reviews, and is sitting the bag of PGA Tour Player of the Year Jordan Spieth, and British Open Champion Zach Johnson. 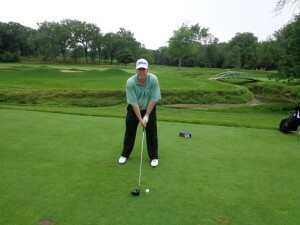 On the Olympia Fields South Course, using the new Titleist 915 Driver. I have been using the 915 since I received it in march of this year, and I have regained some of the distance I felt I had lost with a previous driver. I hope to test out some of the new Titleist products in the weeks ahead, and provide some feedback. I will also be posting some stories about Cleveland Products and some new things from the world of apparel. I do plan to travel to the PGA Merchandise Show in Orlando early 2016, to see all the new products. Demo days will be coming to town shortly as our indoor golf season gets started next month. THE SPEEDGOLF INTERNATIONAL CHAMPIONSHIP tee’s off this morning at the Glen Club in Glenview, final round play is Tuesday. Speedgolf is a round of golf, that includes your score for 18 holes with your time to play them added together. This marks the fourth time the Speedgolf national championship has been held, the first three were held at Bandon Dunes in Oregon. Most players carry a very light bag, and only carry about 4-5 clubs and a few golf balls and tee’s. Defending Champion Eri Crum, who shot a 76 in 46 minutes for a Speedgolf score of 122, will be in the field. For more information see SpeedgolfInternational.com. IT WAS INTERESTING to find out that there are changes coming to the famed Cog Hill Course #4 Dubsdread. Architect Rees Jones has returned and will be taking out some of the bunkers that have drawn criticism from tour players and amateur golfers alike. As many as ten bunkers will go, and few more might become grass bunkers. Tree work, new bunker sand and more is part of plan. Spectator mounds for another tournament will get improved, now if Cog Hill could just land a tournament. But that might take some doing. 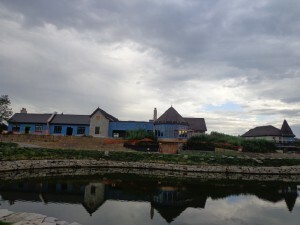 THE NEW CLUBHOUSE at Mistwood is quite ready to open just yet, but the staff at the club begins to take ownership of the new building today. Training and bringing in the merchandise begins, tentative opening day for customers will be about November 9th, hopefully outdoor golf season is still going on by them. The Gog Blog by Rory Spears, Editor and Director of Content. Follow Rory on Facebook, Linkedin and Twitter @GogBlogGuy. 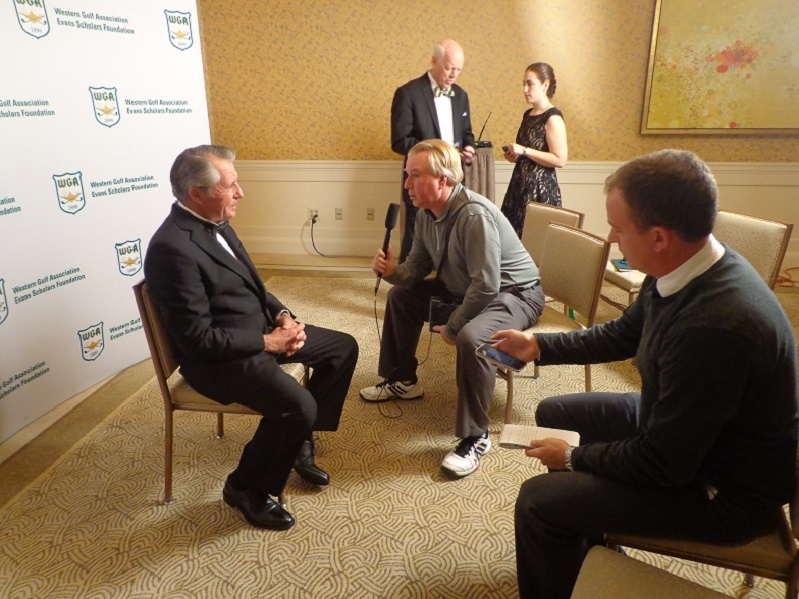 Interviewing Gary Player at the WGA Greencoat Gala Dinner. Gary Player one of only five golfers to win the modern day career Grand Slam, was the main speaker at the Western Golf Association (WGA) Green Coat Gala Dinner, that is one of the main fund raisers for the Evan Scholars Foundation. Player 79, a native of Johannesburg, South Africa, was one of the BIG 3 along with Arnold Palmer and Jack Nicklaus. 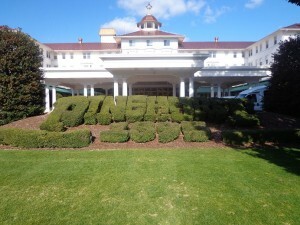 Before arriving in Chicago for the dinner, Player spent the day at the historic Greenbrier Resort, with Palmer, Nicklaus and Lee Trevino as they planned their design of a new golf course for the resort located in West Virginia, now home of the PGA Tour’s Greenbrier Classic. Player whose nickname is the “Black Knight”, for wearing all black outfits while in competition, turned professional in 1953 and won more than 165 tournaments that were played on six continents, including 24 PGA Tour events and nine major championships. 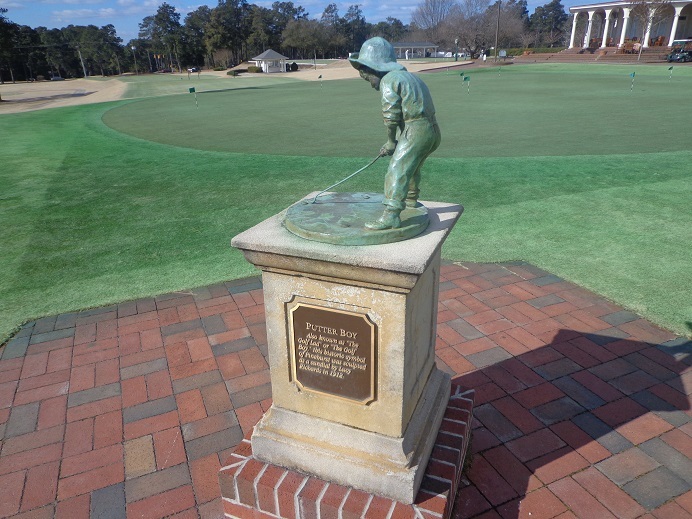 Player won the Masters three times (1961-74-78) the U.S. Open in 1965, the PGA Championship in 1962 and 1972. Player won the British Open in 1959-1968 and 1974, he is the only non-American player to win the career Grand Slam. He still holds the record for winning the Australian Open seven times. In 1966 Player won the Bob Jones Award, the USGA’s highest honor and he became a member of the World Golf Hall of Fame in 1974. He was awarded the Payne Stewart Award in 2006, and was voted in 2000 to be the South African’s Sportsman of the Century. Player was the team captain for the International Team of the Presidents Cup in 2003, 2005 and 2007. He will captain the South African team in the 2016 Olympic games. 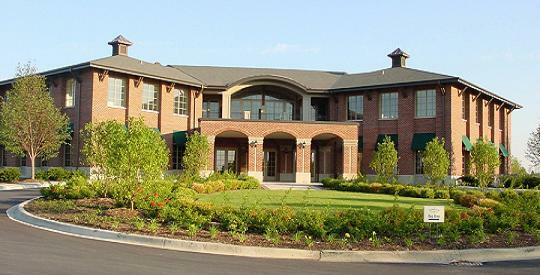 Players golf course design business has created over 300 golf courses around the world. Prior to the Green Coat Dinner, Player met a few select members of the golf media. Click here to hear the interview with Gary Player. The WGA Green Coat dinner raised over $800,000 dollars in 2014, the WGA is hoping to exceed that number this year. 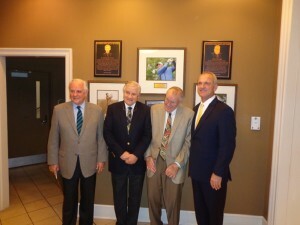 For more information on the WGA and the Evans scholars Foundation, please visit WGAESF.com. The Gog Blog by Rory Spears, Editor and Director of Content. Follow Rory on Facebook, Linkedin, and Twitter @GogBlogGuy, at the newly renovated Mt. Prospect Golf Club. 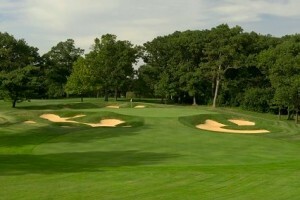 The Par 3, 6th hole on Cog Hill #4 Course “Dubsdread”. EDITORS NOTE: The Gog Blog finally got it’s first round of golf in on Cog Hill #4 for 2015. It was too long in coming, but during the round there were some notable changes on the golf course. After the round was complete, the Gog Blog caught up with Cog Hill owner Frank Jemsek in the main clubhouse, who filled in the blanks on some upcoming work happening on course #4. The first sign of change was some tree removal on the par 3, 12th hole and then some major moving of dirt in the mounding on the left side of the par 3, 14th hole. But as it turned out, that wasn’t all. Jemsek says that architect Rees Jones who oversaw the 2008 renovation of the golf course made a recent return visit to look at the golf course. As a result of the recent tour, Jones is looking at removing about 10 bunkers from the golf course. But some of them could be changed into grass bunkers, especially around the greens. Jones feels that grass bunker shots can be more difficult for touring pro’s to get the result they want in tournament play, than hitting from the sand. grass bunkers are normally easier to play from for amateur players. Jemsek added that all the bunkers will have the sand replaced with a better tour level sand, that should give all players a better lie in the traps. In the front of the bunkers there will be some reshaping done, to make sure players don’t end up with downhill lies to uphill green surfaces. There are some trees that have been or will be removed, a few are because of the Ash Borer disease, others are being removed to improve airflow around the golf course. Dirt from some area projects will be brought in to held redo some mounding areas, especially around Pork-Chop Hill near the 12th tee. The increased elevation will give galleries much better viewing, for when a professional tournament does return to Cog Hill. Jones is looking at adding some forward tee’s on the course, to give new angles for seniors, juniors, ladies, or beginners. Work has started already and will continue until completed. The golf course was aerated nine days ago, and the greens are starting to look in great shape. 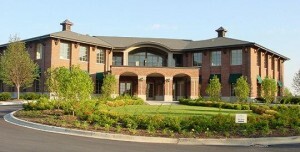 Cog Hill still has some fall events to play in, visit Coghillgolf.com for details. The Gog Blog by Rory Spears, Editor and Director of Content. Follow Rory on Facebook, Linkedin and Twitter @GogBlogGuy. At Bethpage State Park, on the Black Course. On this day where I sit at Wrigley Field about to see the St. Louis Cardinal and Chicago Cubs play Game 4 of the NLDS, I feel the temperatures around town start to drop. #GoCubs BTW. While baseball is one the mind today, my focus returns more to golf tomorrow and the next few days, when tee times is what I will be arranging instead of pre-and-post game coverage’s. But it’s that chill in the air that makes me start to be concerned, along with the calendar that we are quickly running out of days to golf outside. The dome season is quickly sneaking up upon us and the outdoor days will end. Today at Wrigley Field if the Cubs bring their sticks and club out some baseballs, they could go where I was about 1 year ago, and that is New York to play their likely NLCS opponent the New York Mets. Cubs fans who might make the possible trip, could end up enjoying some Long Island golf including Bethpage State Park and the Black or Red Courses, both good tracks. If the Cubs actually do make the World Series, hopefully it will not be against Toronto, because Texas would be a better destination if you wish to bring your clubs. Maybe this year and not next year, the Fall Classic will be made of both baseball and golf for the long suffering Cubs fans. ANOTHER CUP TO PLAY FOR: The Presidents Cup did provide some interesting drama this past week. But in spite of the fact that the battle for the cup in Korea went right down to the last match, and their was a little drama, I’m still not ready to find myself glued to this event. Hey we won the Cup ! okay now that we have it, what do we do with it. Good question, it will be back in the U.S. in 2 years and it still remains to be seen if the U.S. golf fans flock out to this event, that the USA holds a 9-1-1 record in. Meanwhile in Minnesota they are already gearing up for the Ryder Cup at Hazeltine, the 1 year out event was just held, and everyone around the Twin-Cities is getting ready for the biggest golf event in that state since YE Yang dusted Tiger Woods in the 2009 PGA Championship. I’m sorry but there is still something about the Ryder Cup that gets me more fired up for the battle of that cup. BIG 3 partner Len Ziehm is rolling through the state of Washington, and just played Chambers Bay the site of the 2015 U.S. Open, for more read his website, Len Ziehmongolf.com for details. Putterboy is fired up about the Cubs. Visit Pinehurst.com to book your next trip to the home of American Golf. The Crooked Stick Invitational is underway just north of Indianapolis, The Stick that played host to John Daly’s exciting 1991 PGA Championship and the 2012 BMW Championship won by Rory McIlroy. Illinois has jumped out to a lead after the first 36 holes, with Purdue that is coming into the tournament fresh off a win in the Windon Memorial run by Northwestern University is alone in second place. The Crooked Stick Golf Club designed by Pete Dye will host the 2016 BMW Championship and the 2020 WGA Western Amateur. SPEAKING OF THE WGA.. BIG 3 golfer Gary Player hits town later this week to be the guest speaker at the Black Tie WGA Fundraising dinner. One golf publication is reporting that Player’s mansion located in the United States is up for sale, asking price is $6.6 million.